Orangutans Find Mates on Tinder – FIREPAW, Inc.
Stay away from the self-absorbed ones, Samboja! Samboja the female orangutan will scroll through pictures of males and let zookeepers know which ones she’d like to invite over for a little monkey business. As part of an experiment called “Tinder for Orangutans,” employees at the Apenheul primate park in the Netherlands plan to show Samboja images of eligible males on a touchscreen tablet. If she pays extra attention to a picture or video, that’s a sign she might want to meet the guy for some innocent fur grooming — and possibly more. Since Samboja’s prospects come from as far away as Singapore, the zoo wants to increase the chances of dating success by giving Samboja a say in her love life. 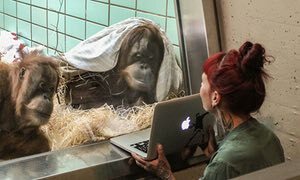 This isn’t the first time orangutans have have played with tablets. Zoos around the world have adopted Apps for Apes, a program from Orangutan Outreach that gives the animals an iPad for mental stimulation.